Hmmm–interesting. Check it out, beauties! 1.Slice three or four okra pods horizontally. 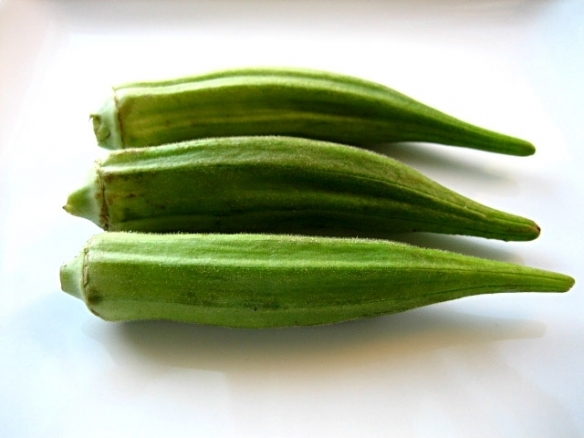 2.Place the okra in 5 ounces of distilled water and boil in a saucepan. 3.Monitor your okra. It should start to break down and look slimy. Once your mixture hits a gooey texture like a loose gel, turn off the heat. 4.Mask that unmistakable okra scent by adding a couple of drops of essential mint or lavender oil. If you don’t like using fragrances, a squirt or two of lemon or a drizzle of honey should brighten up your okra’s bouquet. 5.Cool your concoction for a few minutes. Strain it through a flour sack towel or a tea strainer. If your okra is very watery, some pieces might slip through. 6.Pour the mixture into a clean glass jar that has a tight-fitting lid. 7.Shampoo your hair as you normally do. Squeeze out excess water and work the okra gel through your hair from roots to ends. Massage your scalp with the okra as well. 8.Rinse the okra thoroughly from your hair. Squeeze out water from your hair and style as usual. Let your hair air-dry to minimize frizz and damage. What do you think beauties? Is this too far fetched? Would you try this?! If you would try this okra regimen, click here to read more tips and best practices when doing this at home! Previous Post Rihanna goes BLACK! never heard of this one but what the heck don't think it will hurt and I got some ochro in the fridge and I am in need of a wash…. Thanks a mil for the info. I have been using Okra for 1 straight month and have seen my hair get much thicker and longer in that period of time!!! My question is, can I use Okra every day or do you recommend using it every other week, please let me know what you think. I just tried it today finally. My hair is softer. Too early to see if growth and strength willfollow but I'm definitely will not give up that easy.